We're open Tuesday - Friday, 9 a.m. - 5 p.m. Saturday 9 a.m. to 4 p.m.
Our inventory is constantly changing. We do many consignments; please consider us when you're ready to sell your fine British automobile. We'll work hard to get you the best value. Call us for our commission and policy details at 603-433-0001. Value and insurance appraisals also offered. Most of our fine vehicles are on consignment, all offers will be presented. Click here to take a look at the vehicles we've sold. Please click on our links below or e-mail for photos and call for more information about the cars. Offers are encouraged. Call 603-433-0001 for car details. 1965 Triumph TR4. Red/Black, total body renovation summer 2014. Starts, stops and runs great. Click here for owner's history of this car. 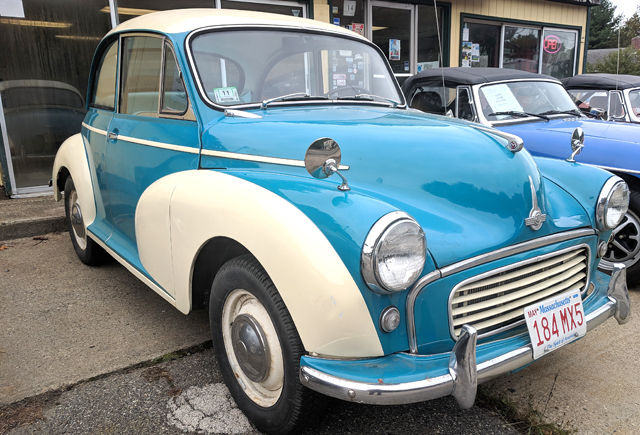 1968 Morris Minor Traveler. White/Black. Purchased in England in 2010, this little right-hand drive woody wagon will take your family in style. Very solid underneath and a very nice driver, it needs some TLC and repairs on some body rust and other worn areas. In our winter storage. Call for more info. 1967 Morgan Plus 4. Yellow & Black/Tan. 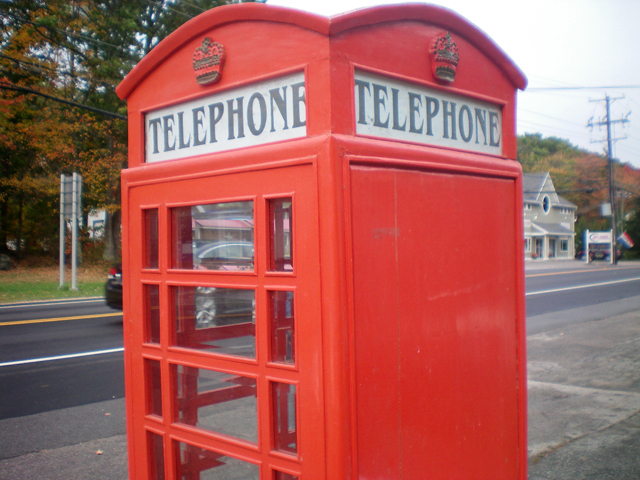 Dr. Who says buy this phone box and you never know. Thirty inches square and more than 7-feet tall, every Britophile collector needs this. Painted wood. 1953 MG TD Mark II. Green/Tan. We offer this well-loved late model TD, in wonderful condition and ready to go. Engine rebuilt, new fuel pump and suspension parts in 2007. Engine has only 500 miles on it since then. 1964 MGB. White/Black. This pull-handle car has a rare original overdrive transmission. A good driver looking for a new home. 1965 MGB. Primrose/Black. 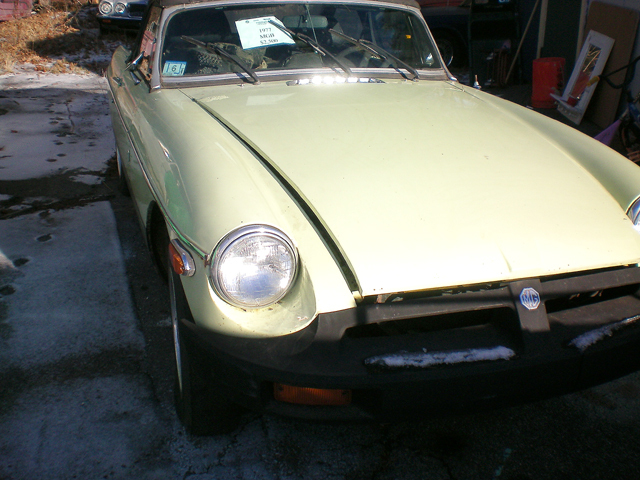 This early MGB is beautiful inside and out. Owned and cared for by one owner since 2001, it has the early pull handle doors and the five-main bearing engine. It's an eye catcher, for sure. 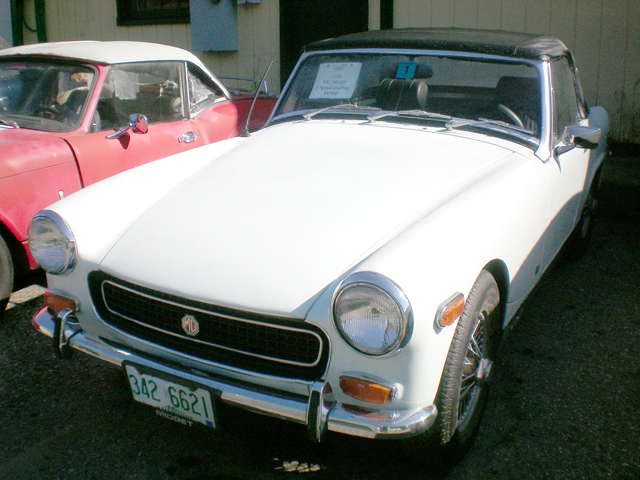 1967 MG Midget. Maroon/ Red and Black. A solid Mk. III with 1,275cc engine, always garaged. Includes new painted hood, five extra wheels and tires and the soft top and frame. Custom seats. Sony CD sound system. 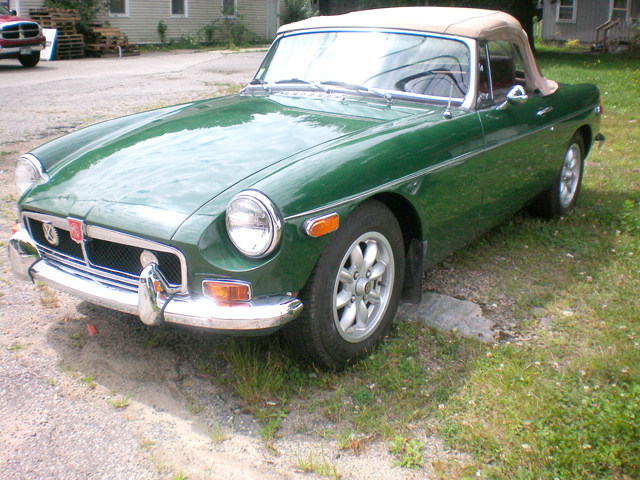 1972 MGB. Green/Black. A good project car that mostly needs lots of TLC. Good top. Good underbody. Service and parts records back to 1994, including engine rebuild, rocker panels, hydraulic systems and more. 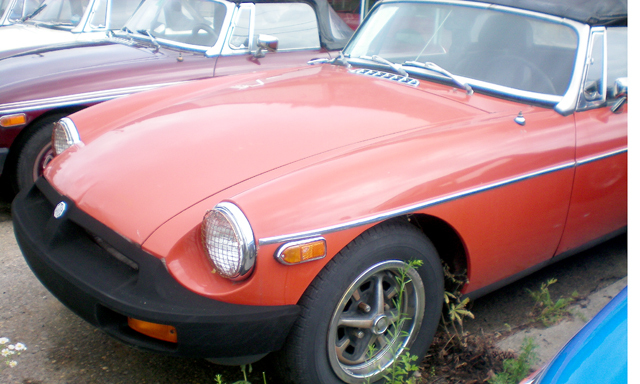 1973 MGB. Red/Black. A good-looking car that's a great candidate for a home mechanic to get a chrome bumper car back on the road. 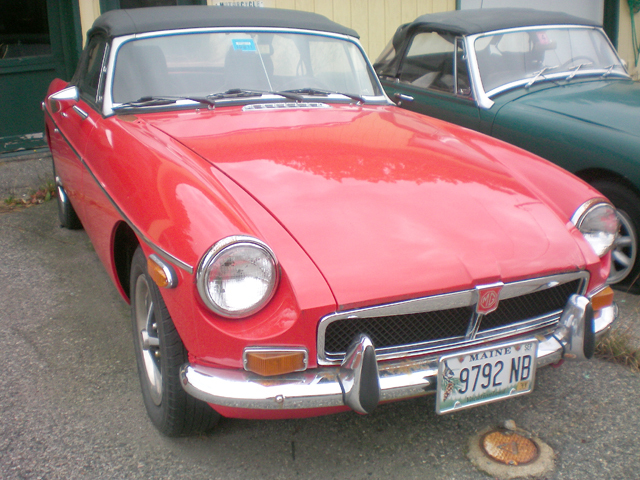 1974 MGB. Red/Black. The car runs and drives well. It was sitting at a light, got hit from behind and bounced into the car stopped in front, causing damage to both ends. Needs a Trunk lid, Rear Valance and a Hood or a patient metal guy to ease these pieces back into shape. It's a good driver, runs nicely and the current owner maintained it well. It has some minor rust. 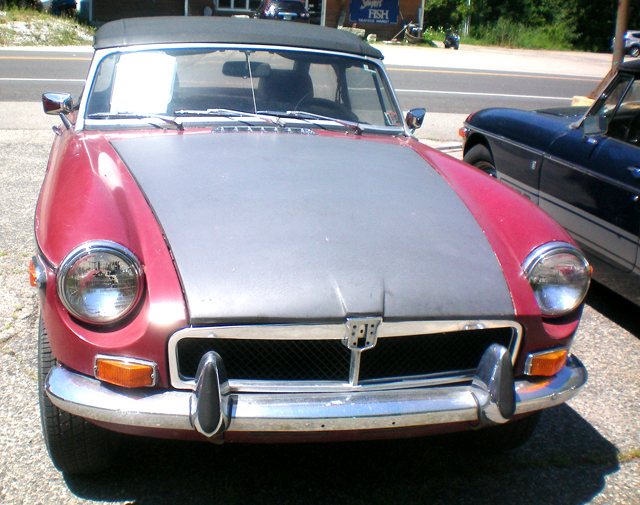 1975 MGB. Blue/Autumn Leaf. Engine desmogged and has Weber downdraft carb conversion. A wood dash and steering wheel dress up the interior while the overdrive transmission and CD sound system make cruising a pleasure. Includes car cover and more. 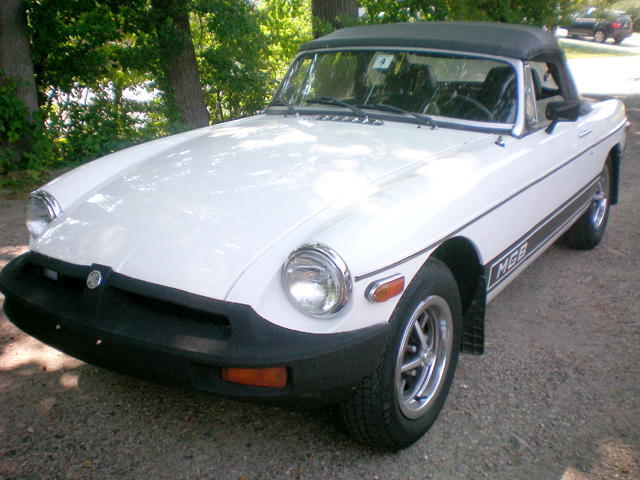 1975 MGB. Black/Black. Good driver, rare black model, Minilite wheels. 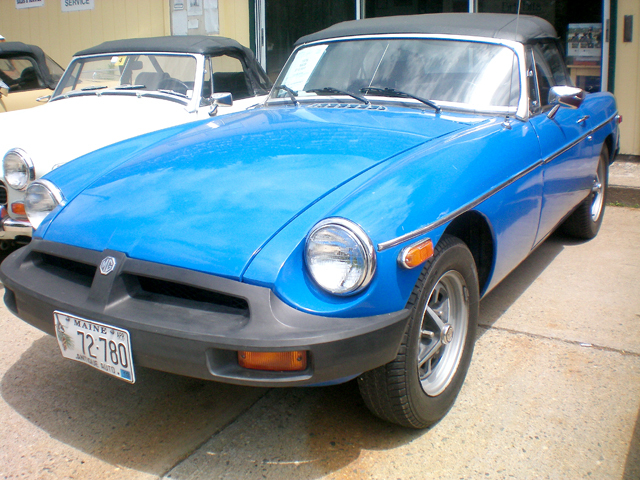 1980 MGB Blue/Beige. Nice condition. Chrome wires, new top, Weber carb conversion. 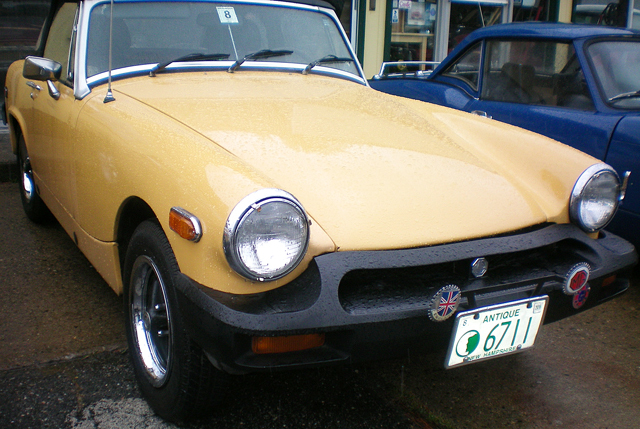 1969 Triumph TR6. Yellow/Black. A nice looking, well maintained, good running rust-free car. Recent tuneup. Engine thrust bearings are good. Rear wheel bearings are good. Stored offsite for the winter. 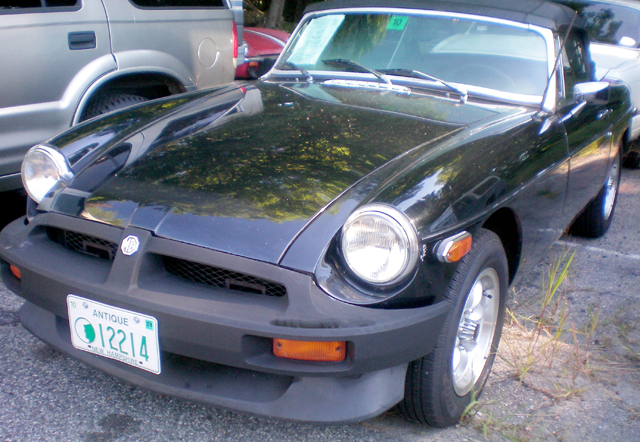 1980 Triumph Spitfire. Orange/Black. Very solid, runs well, needs little. 1979 Mercedes Benz 450 SL. White/Tan. 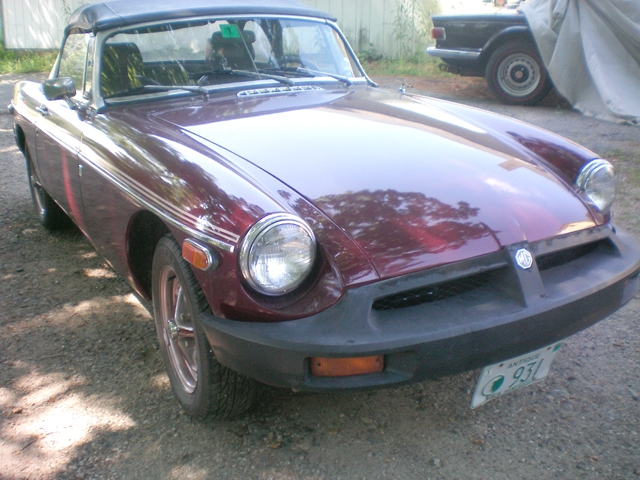 This desirable M-B model is a driver that needs some TLC to get back on the road. Comes with removable hardtop and convertible soft top. All of our fine automobiles have been thoroughly checked over, and the condition of each vehicle is described as accurately and honestly as possible. 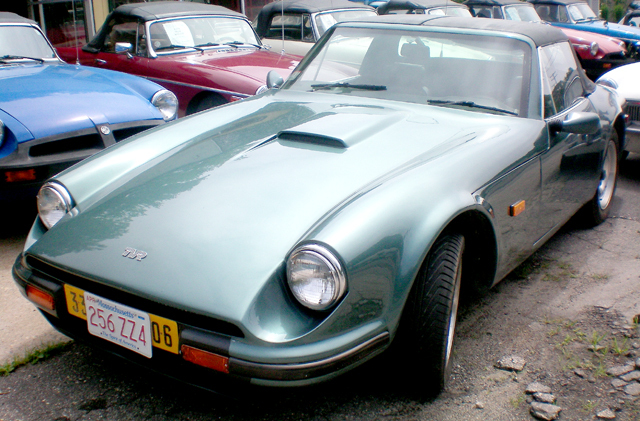 We do not list the mileages for these vehicles unless we absolutely, positively know the history of the car. Speedometers and cables are easily broken, switched or replaced, so test rides and visual inspections both topside and underneath are recommended. Vehicles are sold as is with no warranty -- these are older vehicles and while x-ray vision is a goal, we have not achieved it as yet.